Pretty little milk jugs all in a row. Other B&W pictures can be found at Aileni's site for Monochrome Maniacs. Good choice of subject. Pretty mono frame. The lighting of this shot is perfect! Very nice. Exquisite! Reminds me of the "good old days" at my uncle's farm. Simple subject with great use of the light. I am at a loss for superlatives. You are quite a pro at this black and white stuff! The milk cans remind me that the farmers are losing money on milk right now. Complicated business. Somehow this metal does not look cold but warm and cozy. You've got a real talent to extract beauty from the more simple things.. Wonderful shot. It begs the question, do farmers still use milk jugs? Boy, I'm sure dating myself. They probably have some large centralized holding tank thing. I'll join my words of praise to the other commenters. This is a really fine image. How nice! It looks like it could have been taken years ago. Love this. Down to the cobwebs. Very fine image. Wonderful! Makes me wonder if this is from another century! The lighting is so well done that I can see all the dings and dents from years of hard use. Great choice for black and white. Very nice. BTW, when I first clicked over to your blog, the browser was open on a monochrome monitor, and all the pictures on this page look great in monochrome. It could be a perfect vintage postcard, soooo beautiful! I think you must hang around some mighty interesting places. This shot is wonderful. FYI: I like the way you've framed this and your other photos. 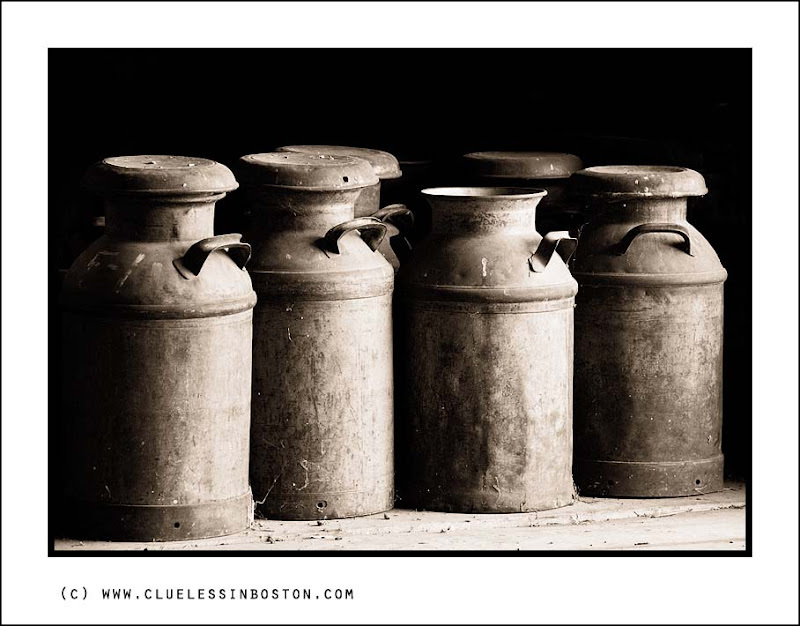 I love the texture of the jugs and all the shadows, great photo. Got milk? This is purrrrty! Beautifully shot, and with your frame it looks just like an art postcard.